Nx Nastran is a finite element (FE) solver for stress, vibration, buckling, structural failure, heat transfer, acoustics and aeroelasticity analyses. 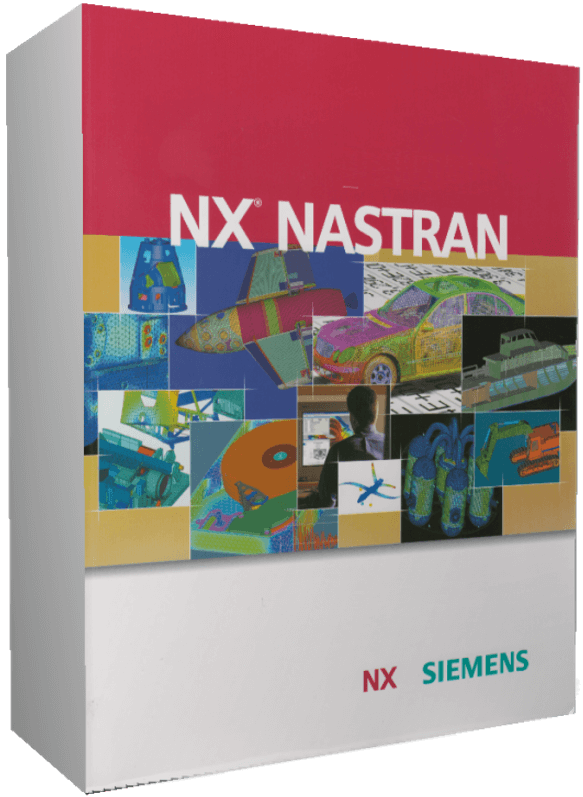 Manufacturers as well as engineering suppliers in aerospace, automotive, electronics, heavy machinery, medical device, and other industries have relied on NX Nastran software for their critical engineering computing needs for over 40 years. It allows them to produce safe, reliable and, optimized designs within increasingly shorter design cycles. Nastran is directly compatible to analyze composite structures, with individual ply representation. Linear analysis assumes that materials are not strained beyond their yield limits and that deformations remain small in relation to overall dimensions. When deformations are large, linear material assumptions are invalid, or contact is a factor, then nonlinear analysis is the appropriate simulation choice. Dynamic analysis is an important known strength of NX Nastran. From transient, to frequency, to random loading, to shock response, NX Nastran covers the full range of dynamic solutions. Using optimization techniques, engineers can improve a proposed design, resulting in the best possible product for minimum cost. Aeroelastic analysis enables analysis of structural models in the presence of an airstream. Rotor dynamic analysis allows engineers to predict critical speeds for their systems and develop designs that operate away from these unstable speeds. Having all these solutions in one solver means that input/output file formats are the same for all solution types. Linear surface to surface contact and glued connection that can be defined either between element faces or geometry surfaces and is easily set up with Femap’s assembly management functionality. The heat transfer capability provides solutions to steady state and transient thermal analysis and design problems. Heat transfer can span the full range from system-level analysis of global energy balances to the detailed analysis associated with temperature and thermal stress limit levels. Allows you to investigate linear or nonlinear problems, steady-state or transient effects, as well as all three types of heat transfer (conduction, convection and radiation), displaying the characteristics associated with each. The basic nonlinear capabilities include nonlinear static and transient analyses that include large displacement and nonlinear material analysis as well as gap and slide line contact. Enables you to analyze models with geometric nonlinearities; that is, large deformations or with material nonlinearities. Point-to-point contact nonlinearity can also be simulated. This basic nonlinear capability allows users to evaluate whether the small displacement and linear material assumptions used in linear analysis are accurate. NX Nastran Dynamic Response provides an advanced suite of tools aimed at providing users with a flexible tool to analyze the response of models that are subjected to loads that vary with time or frequency. As such NX Nastran Dynamic Response includes a comprehensive range of response simulation capabilities; normal modes analysis and complex Eigen analysis, frequency and transient response analysis, acoustic analysis, response and shock spectrum analysis, component mode synthesis, and random vibration analysis. In addition Dynamic Response can be effectively coupled with other analysis types such as Superelements, Non-linear analysis, design sensitivity, and optimization. These solution types can be leveraged for a number of advanced simulation capabilities to analyze more complex phenomena such as control systems, coupled fluid/structures, Gyroscopic and Coriolis effects and transfer function. NX Nastran Dynamic Response is a specific add-on module to NX Nastran (NXN001), it is also included in the NX Nastran Advanced Bundle (NXN002). The covered NX Nastran Solution sequences include: 107, 108, 109, 110, 111, 112, 118, and 187. NX Nastran Aeroelasticity provides efficient simulation for the interaction of aerodynamic, inertial, and structural forces that are prevalent when any structure is exposed to high, static, or time dependent, loads due to the effects of an air stream. This can provide critical performance information and insight into the aerodynamic behavior of airplanes, helicopters, missiles, suspension bridges, etc. across a range of Mach performance numbers. A range of static aeroelastic features allow for stress, load, aerodynamic, and control system analysis and design using a common finite element representation. In addition to static analysis, simulations can be bolstered with the inclusion of a number dynamic response and flutter simulation methods. Parallel computing in NX Nastran using the Distributed Memory Parallel (DMP) capability allows you to take advantage of memory and disk resources on multiple computers or clusters, with one or more processors, communicating over a network. Using the NX Nastran DMP capability you will be able to reduce solution time on large models, reduce hardware requirements by using smaller and less expensive machines, and decrease solution turnaround time allowing you to analyze more designs. NX Nastran Super Elements provide a method to reduce the complexity and resource demands of large analysis problems. Superelement capabilities can be used in all types of analysis including Statics, normal modes, buckling, transient response, frequency response, heat transfer and non-linear analysis.The Superelement technique involves breaking down a large structure into a set of smaller substructures known as superelements. The simulation results from Superelements can be processed individually or all at once. These results can then be combined into a final solution, for the model as a whole.The advantage is that computer resource requirements are lessened and the entire simulation can be broken into smaller simulation pieces, which can be undertaken by different product development groups, without necessarily revealing proprietary modeling information. NX Nastran DMAP (Direct Matrix Abstraction Program) provides a sophisticated programming language that allows users to expand and customize NX Nastran’s capabilities by writing their own applications and installing their own custom modules. NX Nastran DMAP comes with its own compilers and grammatical rules that are deeply linked into the core capabilities of NX Nastran. In fact, each type of analysis in NX Nastran is based on a pre-packaged collection of hundreds or thousands of DMAP commands.This extreme flexibility allows users to modify the normal flow of a solution sequence and provides NX Nastran customers with a way to take more advantage of Nastran by adding more capabilities, integrating NX Nastran into other applications and customizing NX Nastran for specific applications. With the Femap with NX Nastran Optimization module you can improve upon existing designs through the manipulation of element properties such as plate thicknesses and beam sections. The design can therefore be optimized to minimize weight for example, while maintaining specific responses such as displacements or stresses. Optimization may be applied to a broad range of NX Nastran analysis types, such as linear statics, normal modes and buckling analyses. In addition, it also includes a broad range of optimization capabilities that can be used with the more advanced NX Nastran capabilities such as dynamic response. The Advanced Nonlinear Solver enables users to address a range of challenging nonlinear simulations including surface-to-surface contact, large deformation, large-strain, and nonlinear material properties in accordance with Femap. Material models that can be used include: elastic isotropic, elastic orthotropic, composites, gasket materials, elastic-plastic, hyperelastic, temperature dependent, nonlinear elastic and elastic creep. Solution capabilities include: static solutions, dynamic solutions, creep analysis, load displacement control, and automatic time stepping. Surface contact capabilities include: single and double sided, self contact, all contact, friction models, offsets, and rigid and flexible contact surfaces. NX Nastran Rotor Dynamics is an add-on module to NX Nastran Dynamic Response or NX Nastran Advanced, for performing dynamic response analysis of rotating systems. NX Nastran Rotor Dynamics will enable users to predict the dynamic response of rotating systems such as shafts, turbines, and propellers. The analysis will predict modes of the system as a function of shaft rotational speed and identify the critical speeds of the shaft (i.e. speeds at which the response becomes unstable). Solution capabilities include: multiple rotors, fixed or rotating coordinate frames of reference, general model types (i.e. does not have to be line model), symmetric or unsymmetrical rotor models. In addition, the solver supports synchronous solutions (solve for rotational speed that is coincident with rotor modes) and asynchronous solutions (solve for modes of rotor as function of varying rotor speed). Structural Analysis Toolkit provides a general purpose result manipulation and processing toolkit for Nastran solutions within the Femap environment. By processing data from a NASTRAN binary results file it is possible to present results in ASCII text, Microsoft Excel, Universal file and HTML formats. This allows easy summation of complex stresses, margins of safety, complex grid point and element forces, modal analysis summaries, random and harmonic base excitations. Valuable analysis time can be saved with the Toolkit through easier manipulation of numerous datablocks and organization of results data.